Do you have any idea what you're doing? Disruption, reinvention, rapid change and transformation. How do we know what to do? And is it ok if we don't know what we're doing? 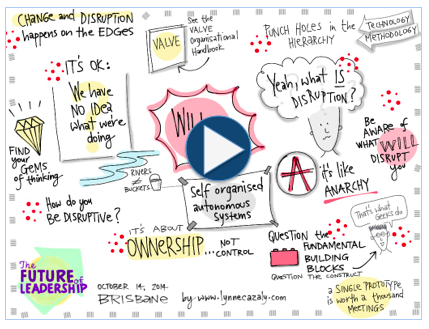 Will Dayble presented a great session last week at the Future of Leadership in Brisbane, on Disruption. Here's the still and below is the moving picture of my digital visuals from Will's session. You can check out the rest of the visual content from the event's nine brilliant speakers in digital format. When the topic was about the future, paper and markers just wouldn't do!